If only Hanna Farber was good at something! Her pinafores are dirty, her needlework is sloppy, and she’s a nuisance in the kitchen. When the Farber family moves from the cramped, stuffy slums of Red Bank to their new spacious home on Caernarvon Street, Hanna hopes things will change. But the city’s living conditions are getting worse than ever. The cotton mills are closing and the poor, starving people of Northwest England need serious help—fast! What can Hanna possibly do to assist them? 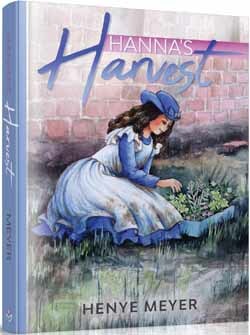 Hanna’s Harvest is a colorful, heartwarming tale of discovery and determination by Henye Meyer, the popular author of Starlight. In this historical masterpiece, Mrs. Meyer faithfully recreates Jewish life in Victorian England—from its busy cobblestone streets to the magnificent Great Synagogue. Readers will cheer Hanna on as she strives to become the heroine she’d always dreamed of being.